The Italian Greyhound is a true miniature of the Greyhound, and goes back to the times of the Egyptian Pharaohs, as drawings of small greyhounds, very similar to the Italian Greyhound, were to be found painted on the walls of their tombs. They were most likely taken by the Romans from Egypt to the Mediterranean, and became very popular in the European courts for a number of centuries. In England, the Italian Greyhound could be found in the courts of the Stuarts, and Queen Victoria also owned these dainty little dogs. They also featured in many paintings of aristocratic families. Italian Greyhounds can live to about 14 years of age. The Italian Greyhound is vivacious, alert, highly intelligent and very affectionate, especially when kept as a companion in the house, loving human companionship. They do not thrive well as kennel dogs. They are easy to train and are quick learners. Italian Greyhounds are generally cheerful, brave and courageous, but as they are also sensitive to loud voices or harsh words from their owner, they may become quite timid in the wrong environment. They get on well with other pets but may need to be protected from larger, more boisterous dogs. Well-fenced gardens are essential as there is a high risk of injury if allowed to roam free. 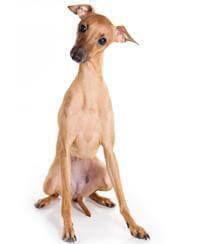 Ideally, the Italian Greyhound is a house dog that should have access to the garden via a dog door. It needs a warm bed or basket, away from draughts, and containing a soft blanket or rug, as most Italian Greyhounds love to wrap themselves up in their blanket, even in the hottest weather. The thin, glossy coat is easy to keep clean, sheds very little hair and is virtually odourless. After bathing, care should be taken to make sure it is thoroughly dried. Although as previously stated the Italian Greyhound is quite hardy considering its fine build, it is not suited for rough play as bones may be broken. It is therefore better suited to a household with older children who can be trusted to treat the dog with care and consideration, and also makes an ideal companion for the elderly and the infirm. Families with older children, and people who can provide a loving, peaceful environment.